What’s Your Pathway to CLA? At the beginning of a new year, we are encouraged to make a fresh start. This year, I’m not picking up something new, but rather taking a different outlook to my ongoing work. To get that fresh perspective, I thought I’d try some of my own “medicine” from the five-day course we teach about Collaborating, Learning and Adapting (CLA) - USAID’s approach to organizational learning and adaptive management in the program cycle. In this course, we introduce participants to the CLA framework and its 16 subcomponents, and acknowledge that each of us is likely already engaging in CLA approaches and actions to some degree. What makes the CLA concepts powerful is how they are used. When CLA approaches are systematic, intentional, and resourced, they add up to something larger than a sum of their parts. Identify where you want to go on your journey. Knowing where you want to go is a good first step of any journey. The ultimate goal of CLA is to achieve better development outcomes. Focusing on the outcome helps avoid narrow thinking or pre-determining the path or solution. Another way to get at this is to ask, what are you trying to accomplish? The more specific you can get in defining your ultimate outcome, the easier it will be to chart your journey. What is the issue you are working on in support of USAID's mission? What are you already doing to reach your destination? What are the challenges/opportunities you face in getting there? 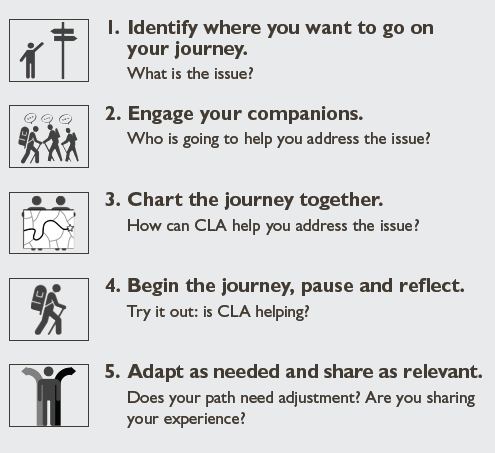 The good news is, CLA is a journey not taken alone. I like to say CLA is a team sport. So an important part of charting your path is identifying the team that will help you address the issue. Who will help you assess the landscape, plan the journey, and/or travel with you? How would you engage your companions and when? I like to think of this initial group of companions as the core planning team. This is the group that will help you see the effort through from start to finish. Just remember, collaboration doesn’t end there - it’s a CLA approach that you will constantly come back to. You are likely to identify other collaborators - both internal and external - as you go along. It can be tempting to act quickly and set off on what seems to be the obvious path, but I encourage you to consult with your colleagues in order to choose the best path by systematically considering different aspects of the CLA framework, intentionally selecting actions that will have the most impact and ensuring there are resources, time, and people with the right skill sets to support those actions. What components of the CLA framework would help chart your path? What is the entry point? How supportive is the current environment of your journey? What enabling conditions of the CLA framework offer possible solutions and can help you make an impact? What tools/techniques will help you move along this journey? What does success look like? How will you monitor and evaluate? Let me caution you, it’s easy to get overwhelmed. Perhaps the most critical piece of advice we offer in the course is to “right-size” your choices. It’s not about doing everything, it’s about carefully choosing what will have the most impact. For example, even when moving fast is a critical advantage, take extra time to establish good working relationships and set up processes to ensure the enabling conditions are in place for success. Charting the journey is often a pivotal moment. Begin the journey, pause and reflect. After you chart your path forward, it’s time to go for it. Try out the CLA approaches so you can see if CLA is helping you get closer to achieving your outcomes. Now that you are following your path, how are the CLA tools/techniques working? Are you still on track to where you want to go (monitor and evaluate)? Pause and reflect is a critical part of the process. If your progress is uncertain, you may need to look for other indicators of success or change your pause and reflect moments so you can get a more clear picture of your progress toward your goal. Which leads us to the final step. Adapt as needed and share as relevant. Pause and reflect moments ask if your path needs adjustment. It’s possible everything goes as planned and your path is straight, but experience tells us it's much more likely that you will need to adapt your path along the way. Has the landscape/context changed? Has new learning emerged that impacts your journey? Do you need to choose a different path to more efficiently and effectively reach where you want to go? Who else can learn from your journey? The last question is easy to skip over, but it is one that may enable you to have the biggest impact on the the development outcome you are trying to achieve. Others at USAID and beyond may benefit from what you learned - so they don’t have to waste time trying out the same thing you just tried. Not only will sharing broadly help others, it may just help you connect with others who have an approach that does work! We have created a job aid to help outline the pieces of the Pathways along with the guiding questions listed above. You can find it here, as a part of the CLA Toolkit. So does the Pathways process work? We’ve heard from participants in the CLA training that it does! During the course they use this approach to create a personal action plan for integrating CLA. When we check in after the training, we hear great success stories. So, I’m going to try it out for myself! I’m starting off the year with a new look at some old challenges. Meanwhile, I’d like to hear from you… how are you creating your own pathways for integrating CLA in your work?